YOUTH, to paraphrase George Bernard Shaw, is wasted on the young. 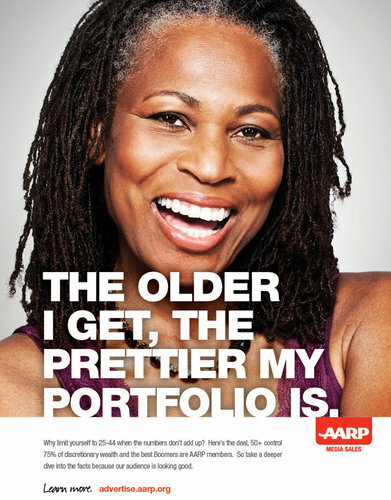 Now AARP says that advertising budgets are, too. The campaign, by Catch New York, will be introduced Monday in Adweek and will appear on Web sites including LinkedIn, Mediabistro and Business Insider. Along with advertisers, ads are aimed at chief executives, marketers and media planners. Patricia Lippe Davis, the vice president for marketing at AARP media sales, said that while a trade campaign last year reminded marketers that consumers over 50 are physically active and avid shoppers, this is more pointed. 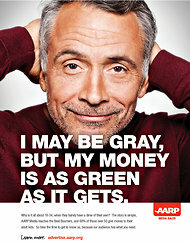 The organization’s print and online outlets include AARP The Magazine, AARP Bulletin and AARP.org. Joseph Perello, a managing partner at Catch New York, said that when advertisers courted consumers in their 20s and 30s two or three decades ago, it made more sense. If there is a tendency to pitch to younger consumers, one reason might be the blush of youth among those creating the ads. Employees from 20 to 34 years old represent 40.3 percent of the advertising field, while that age group represents 31.1 percent of the American work force over all, according to 2011 data from the Bureau of Labor Statistics. Those 55 and over represent 20.6 percent of the general work force, but 15.8 percent of the advertising industry. With AARP membership beginning at age 50, and baby boomers defined as those born from 1946 to 1964, in two years the entire generation will fall within AARP eligibility. Today, 33 percent of the group’s 37 million members are ages 50 to 59, 46 percent are 60 to 74 and 21 percent are 75 and older. Founded in 1958 as the American Association of Retired Persons, the organization started going solely by its acronym more than a decade ago; today only 47 percent of its members are retired. The bimonthly AARP The Magazine, mailed free to households with AARP members, has the largest circulation of any magazine, distributing 22.4 million an issue. Advertising revenue for the magazine totaled $163.3 million in 2011, up from $131.2 million in 2010, an increase of 24.5 percent, according to the Association of Magazine Media. While people 50 and older purchase 62 percent of new cars, according to Ms. Davis of AARP, there are no car companies advertising in the magazine, although both Toyota and Jeep have in recent years. There are also no alcohol brands on board, although Michelob Ultra has advertised in the past. Marketers are well aware that older consumers are purchasing their brands and may assume they are reaching them by advertising on television, but Ms. Davis refers to that as just “spill,” shorthand for spillover. “They are reaching our market to some degree with spill, but I’m a firm believer as a marketer that content has a profound impact on messaging,” Ms. Davis said, referring to media content. Denny’s, the restaurant chain, has been a regular advertiser with AARP since 2010 and highlights in its ads that AARP members get a 20 percent discount from 4 to 10 p.m.
Frances Allen, chief marketing officer for Denny’s, said that diners over 50 account for more than 45 percent of the restaurant chain’s guests. “It’s a very fit, active and relatively financially secure market with time on their hands, and we’ve got to make sure we meet their needs in all sorts of ways,” Ms. Allen said. Along with broad-reaching television campaigns, Denny’s also focuses on specific demographic groups, such as people 18 to 25, the intended audience of a humorous and provocative Web series, “Always Open,” which it releases on CollegeHumor.com and on Denny’s Facebook page. “You have to talk to everyone in a way that’s targeted and relevant to them, and to do so in media that’s targeted and relevant to them,” Ms. Allen said. AARP (formerly known as the American Association of Retired Persons) is on a quest to get advertisers to include their demographic in more campaigns. Using tag lines such as “I may be creased, but my money is crisp,” they hope to persuade advertisers that there’s a profit to be made in the over fifty market. Since the dawn of time, advertisers have sought out the younger buyers since they were the ones with discretionary cash. But these days, there aren’t too many 20 years old who are flush with the green stuff. 53% of recent college grads are unemployed or underemployed, the worst its ever been in the last 11 years. So why are advertisers so keen on pitching to a crowd of over-educated, broke young folks? Habit, mostly. If you watch TV, you’ll see that times are a changing. It could be that I’m simply viewing things with older eyeballs, but I don’t think so. I really believe that advertising is starting to take the senior population seriously. The best example of this is the brilliant new ad campaign for the Toyota Venza. One ad features a 20-something girl worrying about how her parents have become old and boring. She finally got them on Facebook but they only have a couple of friends. She has 687 friends. How sad for them. Jump cut to the parents out having a wild night in their new Venza while their daughter sits home browsing Facebook. The other features a recent college grad who has moved back home for the good of his parents, who are also out having fun while he’s home microwaving dinner. And it’s not just the ads on TV, have you watched the new Dallas reboot? Five of the leads are over fifty and star Larry Hagman is 80. Oh, they all make me feel young again! Now, I hear you saying, hey, that’s TV, what about online? I say, it’s a trend that’s applies there as well. A recent study in the UK showed that ecommerce for the over 50 crowd rose 25% in the past two years. Part of the reason, tablets and mobile phones are making it easier for everyone to shop online. And as the population of the world ages, it won’t be long before the senior citizens are the ones who grew up with a cell phone in their hand. My point is, even if all of your marketing is done online, you don’t want to exclude the folks over fifty. They have money, they have the time to browse and shop, and they’re loyal to brands they love.